With over five decades of experience in providing engineering solutions for businesses across various industries, JD McGeown specialises in various areas such as electrical contracting, facilities management, building information technology (BIT), sustainable technologies, and measured term contract work. Today James McGeown (son of the original founder of the company) takes the role of Managing Director and his sister Emer Patterson that of the Financial Director. Since its beginnings in 1961 as a small family business, it has grown to become one of Northern Ireland’s leading electrical engineering specialists with offices based in Belfast, Derry/Londonderry, and more recently Dublin. Due to their continuing growth, it’s important that the company has a strong online presence to showcase its ability and agendas to potential clients. 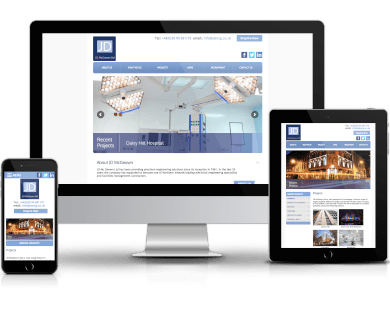 JD McGeown LTD had approached us to update many areas of their underperforming website and so, to begin with, we ensured that the site was updated to make it become more user and mobile friendly, an essential feature for any business online today. As well as this, the projects section was redesigned to highlight the impressive list of clients it has carried out work for. Appropriate training in WordPress was also given so that the JD McGeown team could continue to manage and maintain the site confidently themselves.